Like its title character, a no-frills 1961 folk singer attempting to ply his trade in the era between clean-cut Kingston Trio conservatism and the defiant dominance of Dylan, "Inside Llewyn Davis" resides somewhere between sentimental earnestness and chilly irony. It's far from a feel-good fantasy, but there's something fascinating about watching everything go wrong for an arrogant unappreciated talent who regards planning for the future as "careerist and sad." 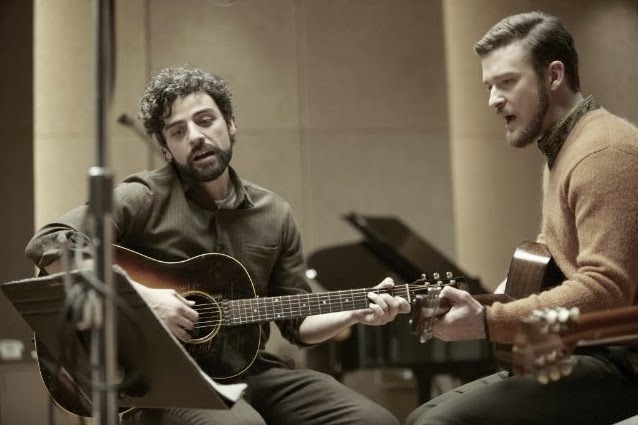 As Davis, the bearded Oscar Isaac seems completely sincere in his acoustic odes about wooing and woe. But his failure to catch a break, the loss of his former duet partner and his general lack of anything resembling responsibility have put him in a downward spiral of mooching money, sleeping on friends' couches and wondering whether to go back to a job with the merchant marines. As fellow folkie and former fling Jean (a pretty but perpetually seething Carey Mulligan) puts it, Davis is like King Midas' idiot brother: Everything he touches turns to…well, something other than gold. Jean's husband Jim (Justin Timberlake), who is as sweetly guileless as Davis is darkly cynical, seems honestly puzzled when Davis derides his goofy new novelty song about JFK enlisting him into the space program. The screenplay by directors Joel and Ethan Coen shows Davis adrift and defeated, without prospects, a home or even a winter coat. A road trip from Greenwich Village to Chicago with hilariously contemptuous jazz musician Roland Turner (John Goodman) is a demented delight. Turner's rude remarks, a dismissive rejection from a club owner and graffiti on a bathroom stall that asks "What are you doing?" all seem to be telling Davis to ditch his dreams. The Coens (and cinematographer Bruno Delbonnel) put the bleak in Bleecker Street with washed-out colors that give the film a faded-photographs look. Their 1961 vision of Greenwich Village includes a shadowy coffeehouse, a dark alley and dismal apartments off of impossibly narrow hallways. Other settings range from the ridiculously claustrophobic clutter of a minor record label office to the surrealistically spacious expanse of a nearly empty restaurant. Also, this is a film where miserable winter weather seems as genuinely cold and uncomfortable as a shoe full of slush. Davis ultimately is that rarest of characters in movies today: a talented, miserable, sometimes unpleasant wannabe who resigns himself to giving up when fate makes it abundantly clear he's not going to make it. One of the screenplay's many clever scenes features Davis literally paying his dues, but then trying to get a refund. Another presents him with an actual road not taken. A runaway cat in the movie may symbolize Davis' elusive dream of making it in the music biz, his inability to care for anyone other than himself, the frustrating fickleness of fate or perhaps all of the above. For the intriguingly unlucky Llewyn Davis, that's life.